Ch 6, join in first stitch made. 1. Ch 2, 24 dc in ring. You will have to force all of them in! 2. Ch 1, sc in same space as ch 1. Sc in each sp. Change to Color A. 4. Ch 1, sc in same space as ch 1. Sc in each sp. Change to Color A. 9. Ch 2, 1 dc in same sp as ch 2. Dc in next 5 sp leaving last loop on hook. Yo and draw through 6 loops, pull firmly, ch 1 (dc in next st, dc in next 5 sp leaving last loop on hook, Yo and draw through 6 loops, pull firmly, ch 1) End with dc in next 5 sp leaving last loop on hook. Yo and draw through 6 loops, pull firmly, ch 1. Change to Color B. Sl st in 1st dc made. 32 puffy stitches. 32 dc. Change to Color B. 10. Ch 1, sc in same sp as ch 1. Sc in next sp. Sc decrease in next 2 sp. ( Sc in next sp, sc decrease in next 2 sp) 31 times. Sc in last sp. Change to Color A. Sl st in 1st sc made. 64 sc. 15. Ch 2, dc in same sp as ch 2. Dc in each sp. Change to Color B. 19 – 24. Repeat Round 18. Hold 2 strands of Color B, leaving a 10 inch tail, ch 8. 1. In 2nd ch from hook, hdc 4 times. 2. In next ch, hdc 5 times. 3. In next ch, hdc 6 times. 4. In next ch, hdc 7 times. 6. Shape into a bud. 7. Using tail that you made a sl st with, using yarn needle, tack the rosebud down. 8. Remove yarn from needle and place the other tail on needle. 9. Fold remaining 2 ch to the center of bud. Tack down. 10. Using a few inches from each tail, secure rosebud in a few places so it will retain its shape. 11. Place bud on hat pulling tails through the center hole. Secure rosebud in place. * There are many ideas for this hat. If you don’t want to have the hat stand to tall take away as many rows of 11-17 as needed. * If you want more height in your hat add more rows in rows 11-17. * In rows 18 -24 you can add or decrease as many rows as you desire. * I couldn’t decide if I should continue with one row of red and one row of white, starting at row 11. Or if I should just continue with all white. You choose. 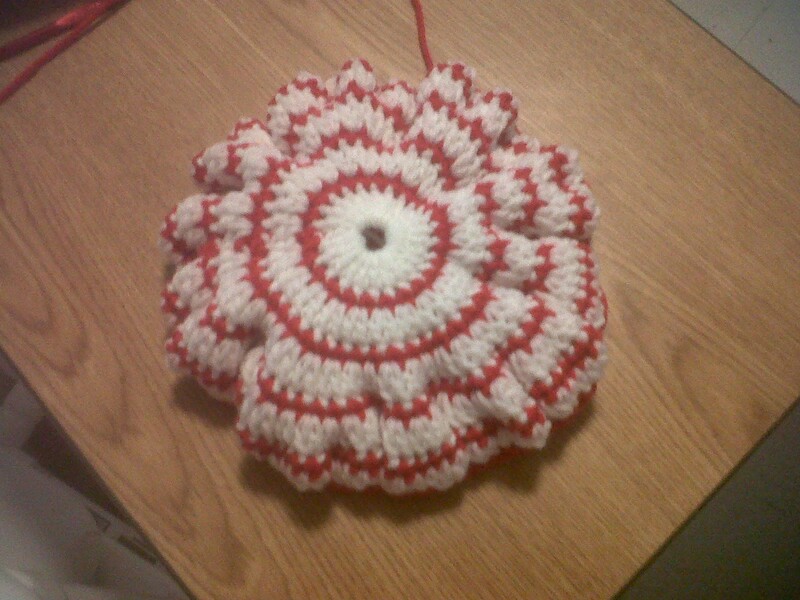 * If you have a leaf pattern you could an a couple of leaves to the rosebud. * There are many possibilities with this pattern. This hat was made with a size I hook. I used Red Heart white and red. I hope to have it finished in a few days! It just depends how busy mom keeps me walking! Rounds 5-8. Repeat Round 4. Round 5 – 8 is where you personalize the length of the hat. Make as many or as few rounds needed so the hat is as long as needed to cover your head. 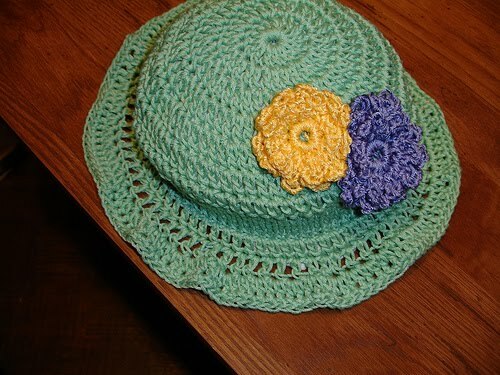 This hat was made with leftover Vanna’s worsted acrylic yarn, a size H hook. the pics of the den couch and its clutter! extra light! I need all the help I can get tonight! It's a very easy little spiral to make! Rounds 5-9. Repeat Round 4. Round 11. Ch 1, sc in same sp as ch 1, sc in next 4 sp, ch 3, sl st in 3 ch from hook (sc in next 5 sp, ch 3, sl st in 3 ch from hk.) 11 times. Ch 7, Hdc in 2nd ch from hk 4 times, hdc in next ch 5 times, hdc in next ch 6 times, sc in next 3 remaining ch. Leave an 8 inch tail. Using tail just cut, thread yard needle and place the 3 sc under spiral and anchor in place with 1 stitch. Remove tail you were using and thread remaining tail on needle. Place needle beside where you just anchored the sc. 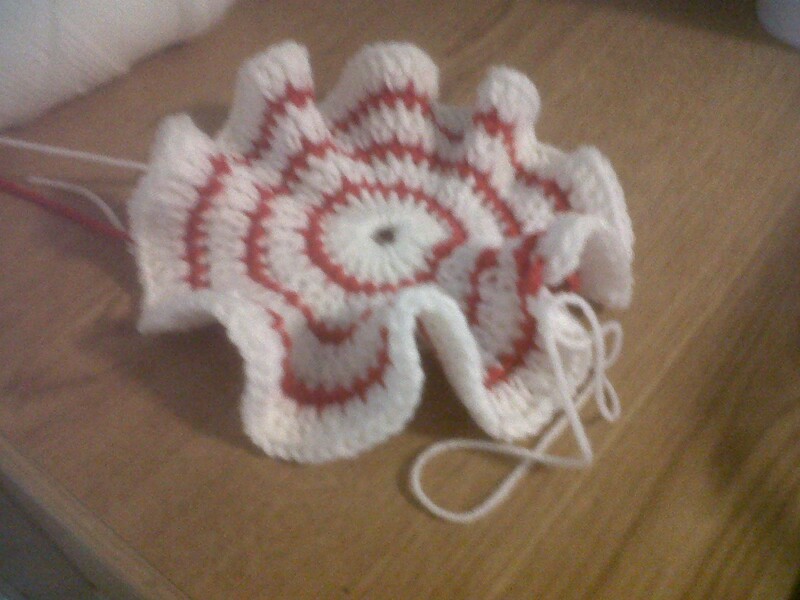 Draw needle through to the opposite side and pull up yarn through so that you have a tail on each side of the spiral. Thread yarn tails on needle and pull through the top of the hat, position spiral in center. Take one tail off needle and using needle anchor spiral in place. Repeat with remaining yarn tail. To anchor spiral, bring needle up through hat and draw needle through bottom of spiral and bring back through the hat. This hat was made with leftover unknown worsted acrylic yarn and leftover Simply Soft worsted variegated yarn. Size H hook. She is doing very well! 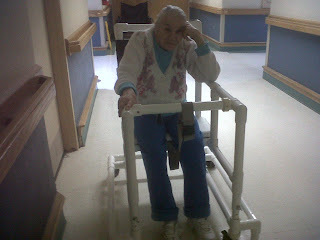 She has this new contraption that she sits and walks in. I call it the PVC pipe chair since that's what its made of! They gave her this chair because she would no longer stay in her wheelchair. She wanted to stand up and go places! She's very wobbly! This chair enables her to walk everywhere! 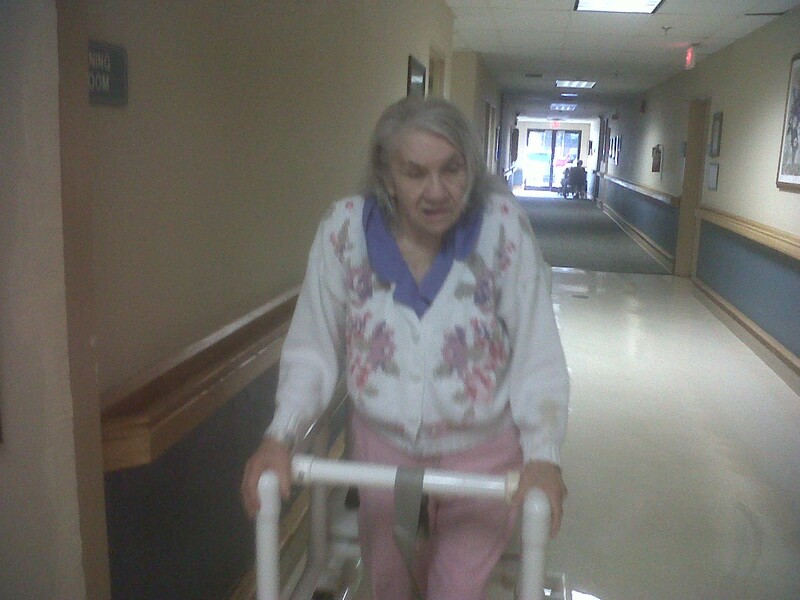 She loves to walk all over the nursing home. I guess what I am trying to explain is that my mom is no longer bed ridden (she was for 7 months) and she no longer is staying in one place most of the time. 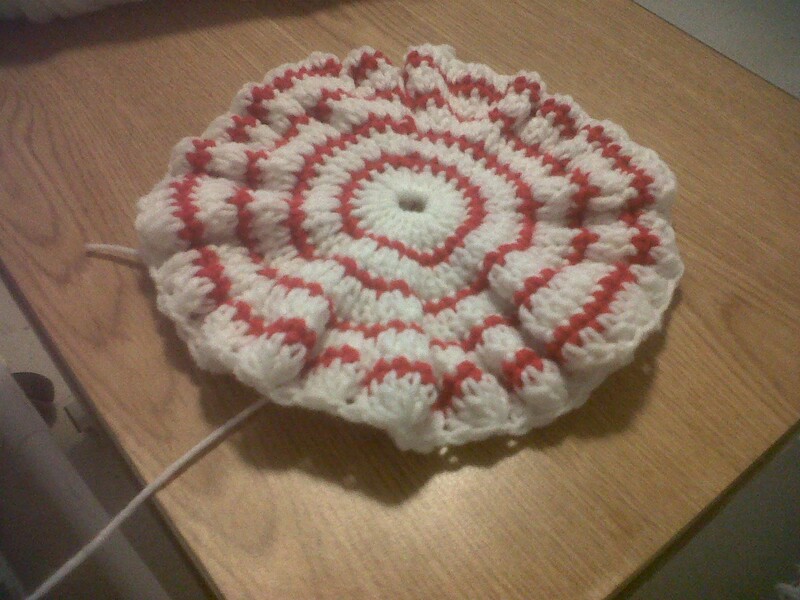 I used to have 5 to 7 hours of crochet time each day and now I am lucky if I get an hour a day. This has drastically cut into my hours I spend writing patterns down. 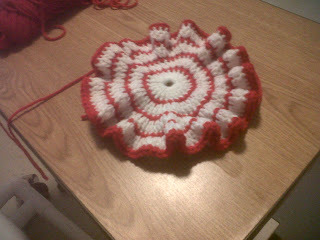 I have decided not to commit to posting a pattern once a week or even twice a month. I will post them as I am able to get them done. I have been putting so much pressure on myself since the holidays as I try to figure out how I will accomplish things with mom gratefully so healthy. Optional Edging: Do not fasten off. Ch 4, skip 1 sp, sc in next sp. ( ch 4, skip next 2 sp, sc in next sp around.) 11 times. Sc in 1st sc made. Fasten off. 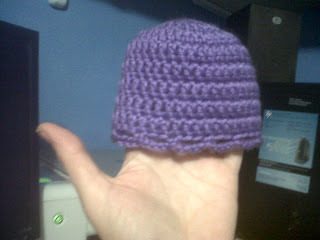 This hat can be made with a size F hook and less rounds for a preemie hat. It can be made with a size H hook and more rounds for a larger or older baby. This hat was made with leftover Simply Soft worsted acrylic yarn, a size G hook. Noel, a cna at the nursing home mom is in, asked for a purple newborn hat. Posted this to Facebook Friday Night! Here is my New Year's Crochet Wish for you! hours, days, weeks and months! May you crochet with peace, with speed, and with happiness! May your goals and dreams flourish! others when it is needed the most! Trying to recover from serious illness. I got a new desk top computer!